Michigan’s Upper Peninsula is one of the most beautiful places on earth. The Pictured Rocks National Lake Shore offer magnificent views of Lake Superior. 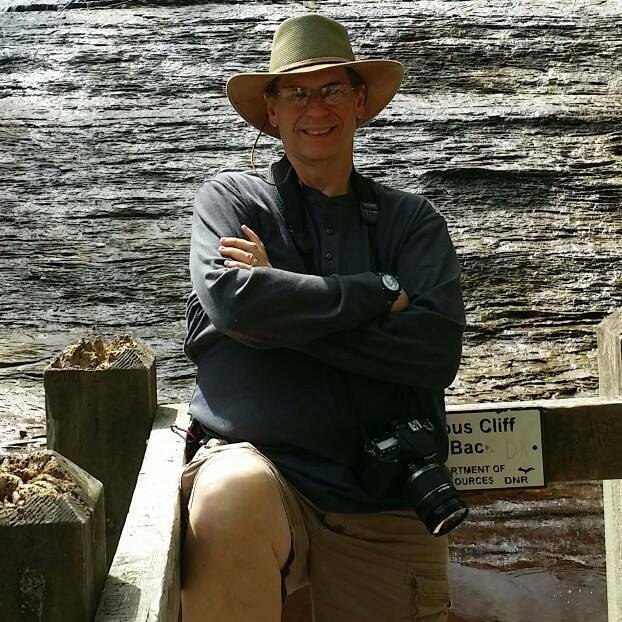 There are over 50 miles of trails along the top of the rocks stretching from Munising to Grand Marais. In addition to Pictured Rocks there are over 200 waterfalls, the most prominent and well known being Tahquamenon Falls near Paradise, Michigan. This past weekend my wife and I went to the UP to visit Tahquamenon Falls, Pictured Rocks, and a few of the other water falls. We ended up taking hikes totaling 17.61 miles on our 3 days. The last hike we took before coming home was to Laughing Whitefish Falls. I had calculated my totals before the hike, so I knew that when I got back to the car I’d be over 100 miles for the month. This is my celebration photo. The hikes were each very interesting. We started with Tahquamenon Falls on Friday. Our intent had been to hike from the lower falls to the upper falls, about a 4 mile hike. My wife had been there previously and knew of a shuttle bus that would take us from upper to lower to start our hike. Unfortunately we learned when we got there that the bus doesn’t run until sometime later in June. We changed our plan and decided to hike from lower to upper and back, which would have been an 8 mile hike. That hike is listed as “moderately difficult” by the Michigan DNR. The first half mile of the hike was very difficult. Many climbs over roots, rocks and hills. Things leveled out, but it was still slow going. When we were about 3 miles into the hike, we crested a difficult hill, and were looking down for the next leg of the hike. We knew that we were about a mile from the upper falls, but that it was going to be difficult. It was getting later in the day, so we decided to hike back and go get dinner. As a result we ended up with a 6.26 mile hike, but we didn’t complete the round trip. We already have decided we’ll be back to do that complete loop, and will allow additional time. On Saturday we started at the Hurricane River Campground and hiked from there, past the Au Sable Point Lighthouse, and up to the Log Slide overlook. It was just over 4 miles to get there, and then we hiked back. The weather was perfect and we thoroughly enjoyed the trail. In the past we’d done each of those two legs of the hike before, but never the entire route. The other hikes we took were shorter, less than 2 miles each. I plan to continue hitting the treadmill, and doing other walking this week. 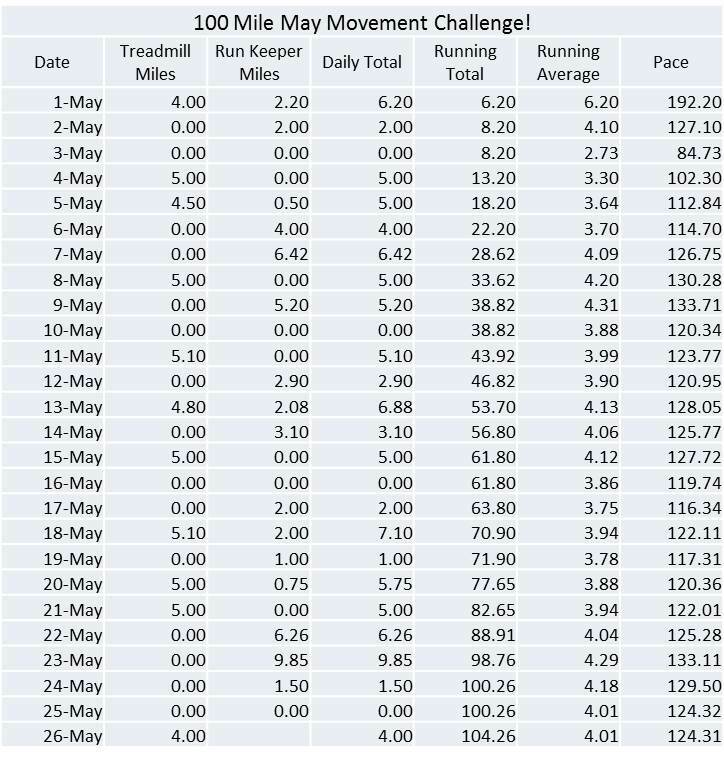 With 6 days left in the month, 130 miles isn’t out of the question for me. How are you doing on your miles? You have about a week left. As of this morning you should be at about 81 miles. If you are a little behind, start now to catch up. As always, though, be safe and make sure you don’t over do it. Enjoy yourself and talk to you again soon! Pretty awesome! So well done.